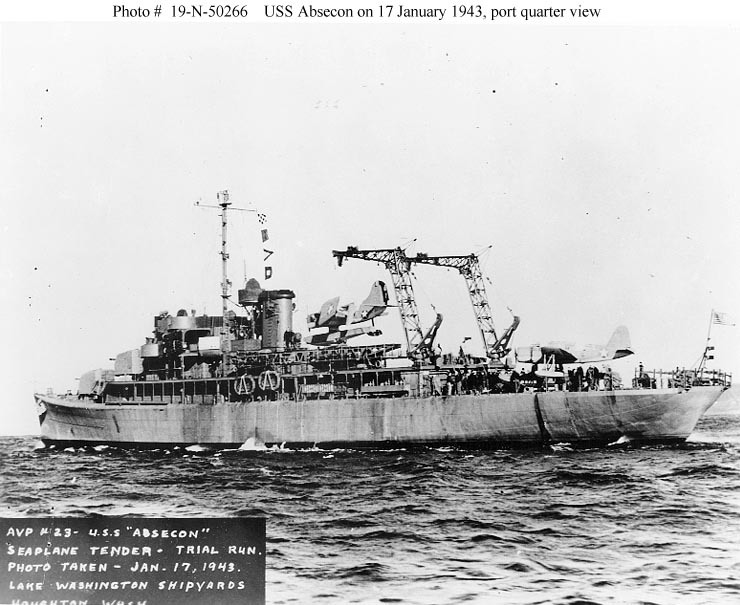 USS Absecon, a 1,766-ton Barnegat-class small seaplane tender, was built at Houghton, Washington, and was commissioned in January 1943. During construction, she was specially fitted with twin cranes and a catapult to serve as a training ship for battleship and cruiser-based aviation units. 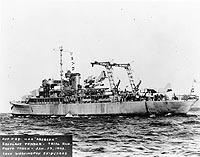 After shakedown training on the west coast, she arrived at Mayport, Florida, in March 1943 and commenced intensive duty in support of the Operational Training Unit at Naval Air Station Jacksonville. She assisted in qualifying pilots and served as a target for torpedo runs. In September 1943 she shifted her base of operations to Port Everglades, Florida, where she continued the same duty. During 1944 and the first half of 1945 she was struck by exercise torpedoes at least five times. In July 1945 she moved to Pensacola, Florida, where she provided support to observation aircraft training units. She was decommissioned in March 1947 and placed in reserve. 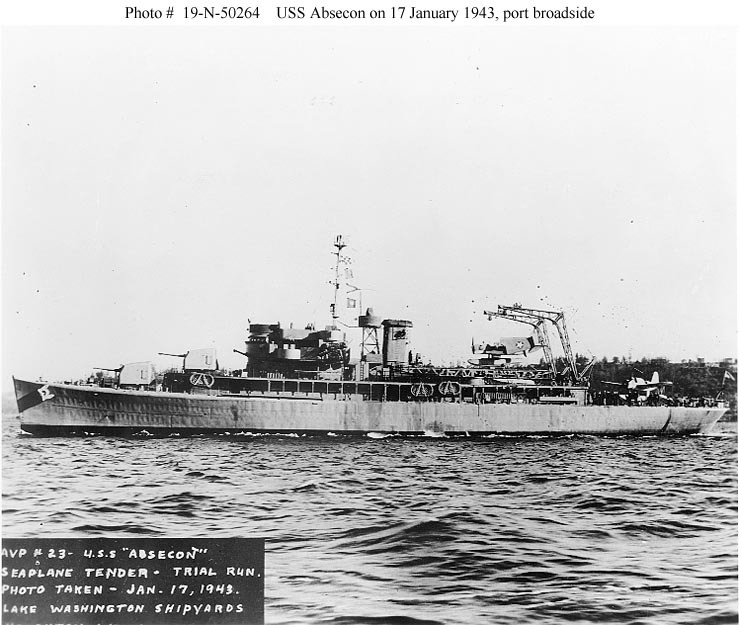 Absecon was loaned to the Coast Guard in January 1949 and served as the cutter Absecon (WAVP-374, later WHEC-374), primarily on weather station duty out of Norfolk, Virginia, through 1971. She was transferred to South Vietnam in July 1972 as Tham Ngu, was seized by North Vietnam in April 1975, and was reportedly still in service in the Vietnamese Navy in 2000. 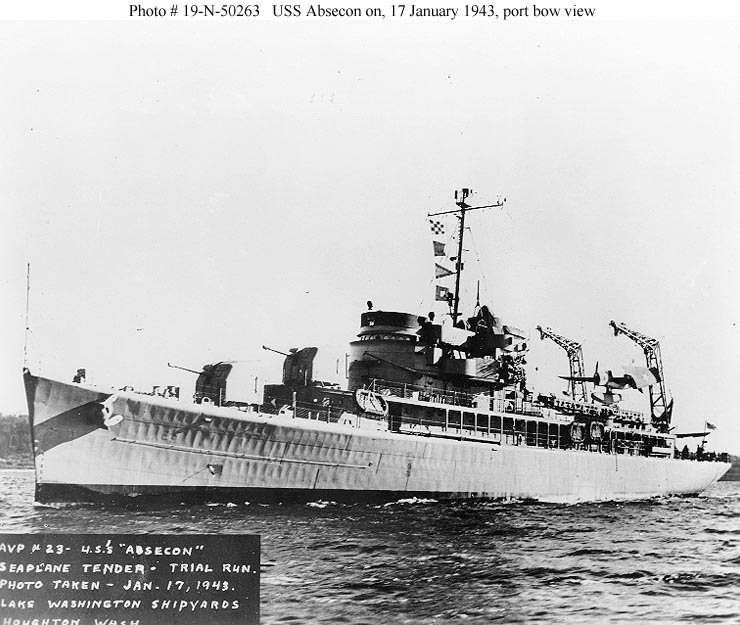 This page features all our views of USS Absecon. 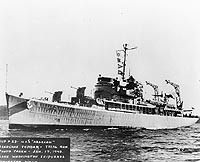 Photographed on 17 January 1943 at Houghton, Washington, on a trial run shortly before commissioning. She has been specially fitted with twin cranes and a catapult to serve as a training ship for battleship and cruiser aircraft crews. The aircraft on the catapult is a Curtiss SO3C Seamew. She has been specially fitted with twin cranes and a catapult to serve as a training ship for battleship and cruiser aircraft crews. The aircraft on the catapult is a Curtiss SO3C Seamew and the one on the fantail is a Vought OS2U Kingfisher. She has been specially fitted with twin cranes and a catapult to serve as a training ship for battleship and cruiser aircraft crews. The aircraft on the fantail is a Vought OS2U Kingfisher and the one on the catapult is a Curtiss SO3C Seamew. 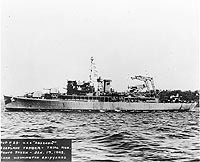 Underway off Fort Lauderdale, Florida, on 6 January 1944. Photographed by PHOM2c J. Chefetz, USN. 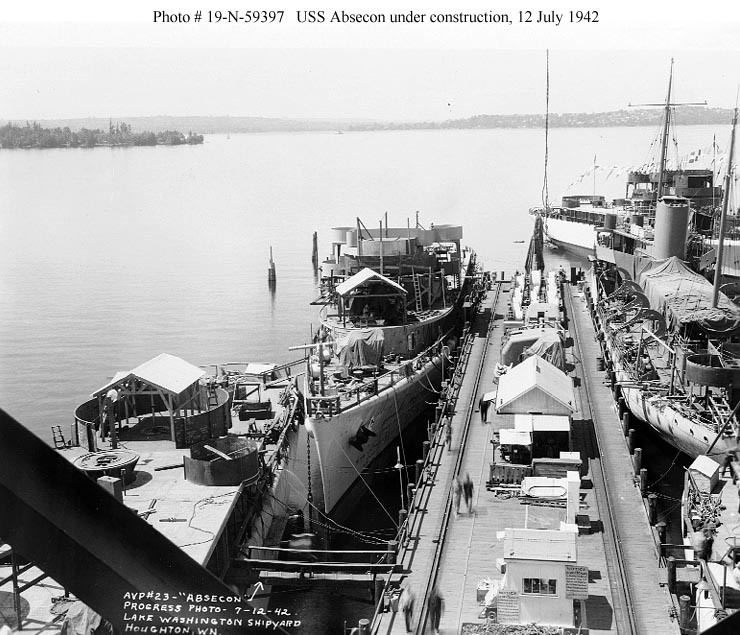 Photographed on 12 July 1942 fitting out at the Lake Washington Shipyard, Houghton, Washington. The shields for her two partially-completed 5"/38 gun mounts are on the pier. Also visible are two other AVPs under construction and a converted yacht. The image listed below is NOT in the Naval Historical Center's collections. DO NOT try to obtain it using the procedures described in our page "How to Obtain Photographic Reproductions." 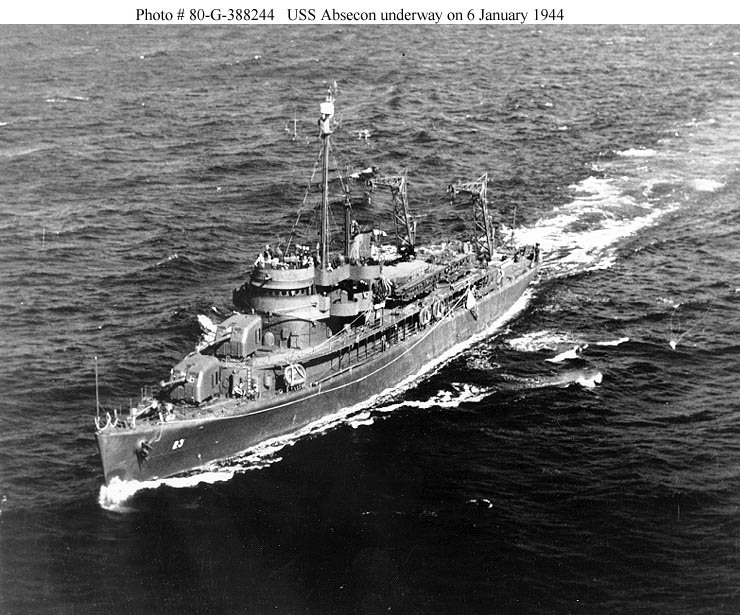 USS Absecon (AVP-23) underway on 14 February 1945. Port broadside aerial view taken by PhoM Terry from an aircraft based at the Fort Lauderdale, Florida, Naval Air Station. 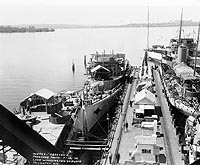 Reproductions of this image should be available through the National Archives photographic reproduction system for pictures not held by the Naval Historical Center. The image listed in this box is NOT in the Naval Historical Center's collections. DO NOT try to obtain it using the procedures described in our page "How to Obtain Photographic Reproductions."